Yesterday I went out looking for owls and eagles in the morning. This is a great way to get out, but also can produce some of my favorite photos of the year when things go right. I struck out in my usual owl spots as I often do, but the eagles were out. I saw four at my usual eagle spot. Two beautiful mature bald eagles, and two immature. The two mature eagles really were not interested in moving. This third year eagle was ready to do something for my camera. It flew close checking me out a couple of times, and then dove down into the Wabash to grab lunch. The grab was done away from me, but it did fly by me with the snack in the talons so I could make a photo of it. 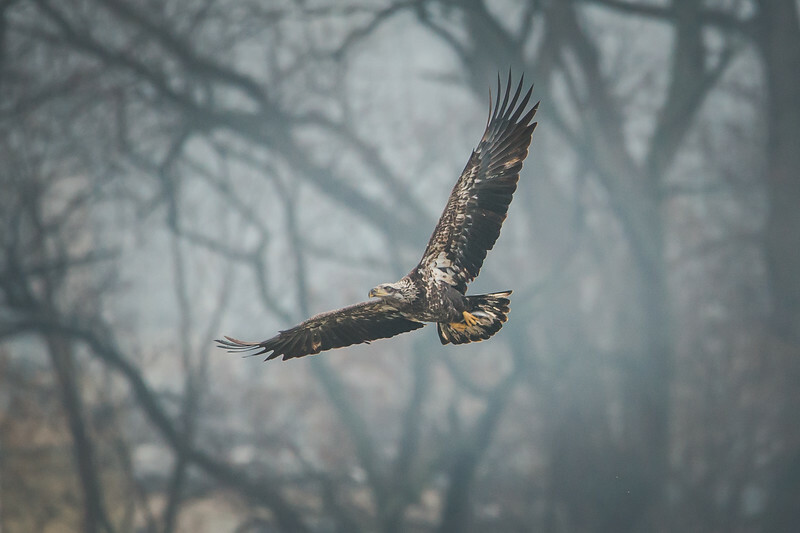 Most people would rather photograph a mature bald eagle in flight or grabbing lunch. I tend to fall into that category. When you are watching an eagle hunt though it is amazing no matter what age the eagle is. The swoop down and grab is something to see. I don’t think that will ever get old to me. I need to see it a few more times this coming winter. The recent warm up took the ice off of the pond and allowed this catch to take place. A cold but not too cold winter is exactly what I need for nice eagle photos.